Plastisol Cold Peel transfers are screen printed transfers which can theoretically be produced in an unlimited number of colours but, in practice, are suitable for up to four colours. The colours are particularly bold on Plastisol transfers and they are very durable. One of their great strengths is the level of fine detail that can be achieved. 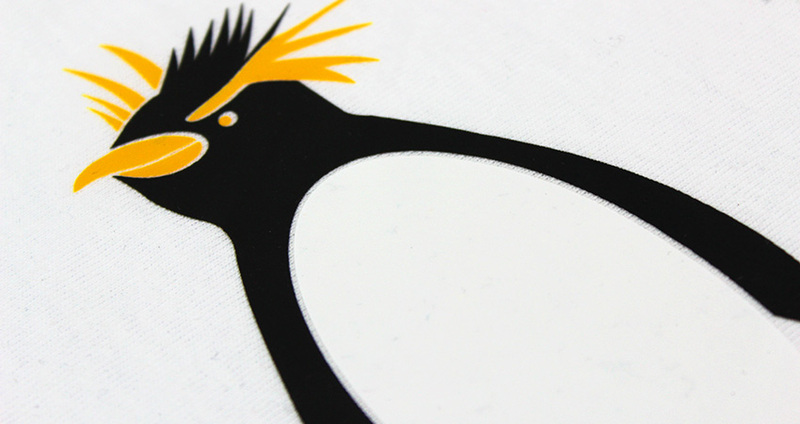 Plastisol transfers are 'Cold Peel' making them very easy to apply and are suitable for most types of garment fabric. Plastisol transfers are a great choice for printing company logos, labels, text and designs with up to four colours where fine detail and vibrancy of colour is the priority. When heat pressed the transfer is allowed to cool before the backing is removed (hence 'Cold Peel') making this a very easy transfer to apply. The transfer sits on the surface of the fabric giving a slightly 'raised' feel and so the overall effect is not quite as soft as a Hot Split transfer. However, Plastisol transfers are brighter and are capable of showing a much finer level of detail. One of the benefits of Cold Peel Plastisol transfers is that there are extra options available with regards to ink. As the example on the left shows you can have metallic effects. 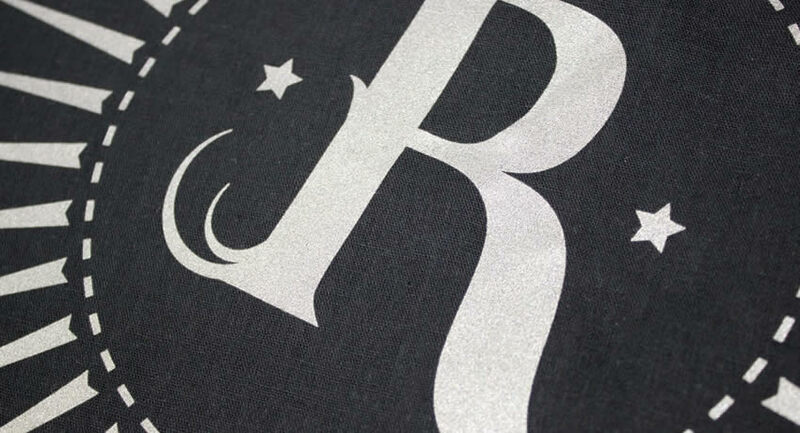 In this case the print is a metallic silver. 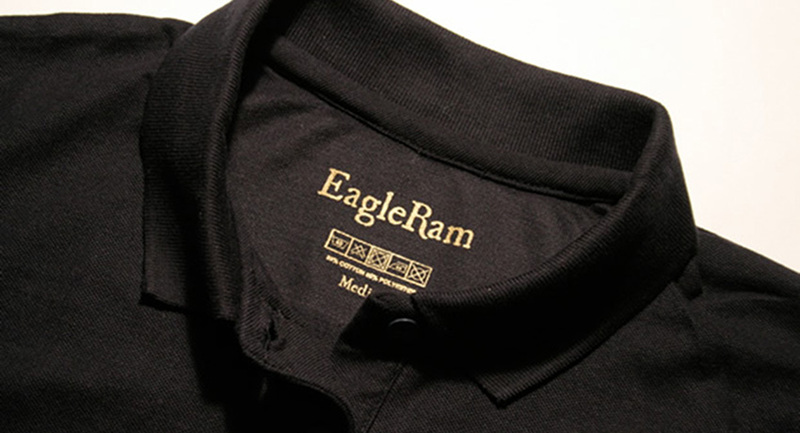 The durability and clarity of plastisol transfers makes them ideal for replacement labels for rebranding garments. The extra level of detail of plastisol transfers means that washing symbols and small text show up clearly even at this smaller size. The small size of these label replacement transfers means that a large number can be fitted onto a single sheet making the cost per transfer very low. Metallic inks work well here as they tend to show up well on a wide range of different coloured garments. 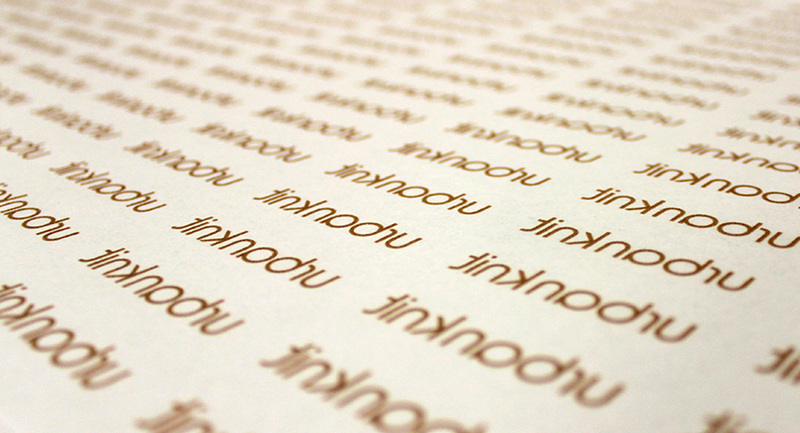 We produce plastisol transfers by the sheet. If your logo is small then you can get many individual transfers on a single sheet making the cost per transfer very low. Send us your design here and we will calculate how many can be fitted on a sheet. Alternatively you can do your own layout - you can include as many designs and sizes as you can pack into a single sheet. Contact us for sheet sizes and other information.